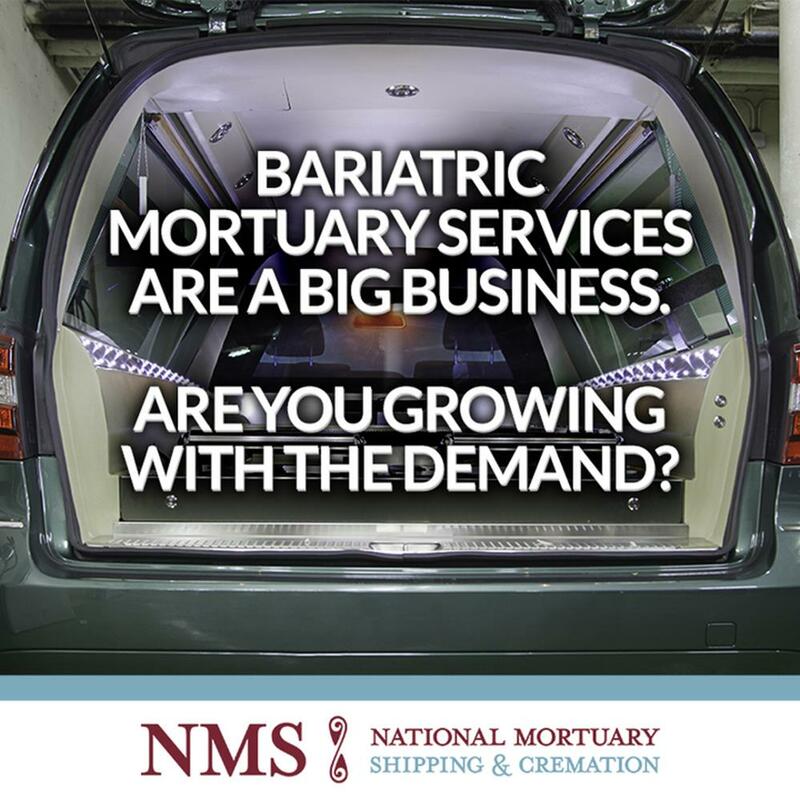 National Mortuary Shipping & Cremation :: Are You Prepared For Success In The Bariatric Mortuary Boom? Are You Prepared For Success In The Bariatric Mortuary Boom? There is just no way to get around it anymore. Our country is becoming larger both figuratively and literally, and that presents concerns that must be addressed in the mortuary and funeral industries. By 2019, obesity will become the number one cause of death in America. There are 130 million adult Americans who are overweight, and 10 million of them are considered to be morbidly obese. So how will that impact the funeral industry? Consider these statistics: 10 years from now almost half of all U.S. burials will require oversized caskets. At this point, there are already 300 oversized caskets sold every day. But it’s not just burial caskets to consider. This will impact you directly. Do you have a vehicle to accommodate larger bodies? Are you staffed for the extra work it will take to handle the arrangements? Do you have crematory equipment that is capable of handling the demands? Chances are your hearse is not prepared to handle the requirements needed to transport a larger sized casket. When the dimensions were laid out, this just simply wasn’t necessary. If you have a mini-van or SUV modeled vehicle, you might have the width required to get the casket in. If you don’t currently have the space, larger hearses are on the market to help accommodate the difference. If you think outside the box, you can come up with some creative ideas. If your facility has outdoor or indoor stairs, you have probably come up with some innovative ideas to transport a normal sized casket around your grounds. Imagine the complications that will arise when you have to take care of a body with a weight of 600 to 800 lbs. Are your doors wide enough to accommodate the width of a larger casket? Once inside the front or back entrance, do you have hallways that might prove troublesome while navigating a wider casket? Funeral homes and morgues are scrambling to find rental spaces to keep bodies until the arrangements are complete. This results in some costly temporary solutions, but it’s time to start thinking about what you can do to provide a permanent answer for the demands of larger bodies. There have been multiple news stories of the bodies of obese clients causing fires in crematoriums because the equipment was inadequate to handle the size. The technique is different. A body with more fat burns at a higher temperature than that of a body with more lean muscle. If you aren’t educated on the proper procedure, or your retort isn’t large enough it can be downright dangerous to handle bariatric cremation. As our own Paul Sobczyk explained to Funeral Business Advisor, bariatric cases are on the rise and can create some very unique situations. Not only is the larger body harder to accommodate spatially, but fluid often has a hard time working its way through the body’s system because of the disease associated with the condition. Tables are not equipped for the weight and you will probably have to rent or borrow a larger piece of equipment. Right now, you and your staff probably use elbow grease and man-power to move bodies around your facility. In the case of an obese body, that might not be possible. Not only is there liability for injury to employees, it just might be physically impossible to move the larger bodies using traditional methods and equipment. Some funeral homes are buying new lift equipment to help with the process. It’s hard to book mortuary flights for larger caskets unless you know the procedure, and even then, it will cost more to purchase the flight. Most commercial airlines have a cut-off of 500lbs for body shipping, so you’ll have to find an alternate carrier, or in many cases, you’ll have to think about rail transportation. Bariatric mortuary arrangements can be difficult and frustrating. And that’s why National Mortuary Shipping is here. We don’t just handle body transportation, we can do it all- from transport to cremation and embalming to the actual graveside service arrangements. Contact NMS today and let us handle all of the bariatric mortuary details so you can focus on the families you serve.